Early History of Amarillo | AHS 50th Alumni Association Inc. It is amazing to realize that the city of Amarillo had its 1887 beginnings only 12 years after roving tribes of Indians had dominated the Panhandle of Texas for centuries. This region was one of the very last American Indian strongholds against invasion by Anglo settlers. After the last hold out, Quanah, ended the Red River War by surrendering his Kwahadi Comanche band to the US Army in 1875, the area was open to settlement for the first time. A small Army outpost, Fort Elliott on Sweetwater Creek, was established in 1875 to keep the Indians on Oklahoma reservations. Hunters were in the process of exterminating the buffalo which had claimed the grasslands on the Llano Estacado for centuries. For the next year, 1875-1876 , the Panhandle remained a vast, empty 165-mile square territory of grass, coyotes, and meadowlarks. Then, late in 1876, Charles Goodnight drove a herd of longhorn cattle into Palo Duro Canyon to begin the first Panhandle ranch. Within 10 years the entire region was divided into ranches, some of them larger than a New England state. During that decade, windmills, along with the recent invention of barbed wire fences, fostered the phenomenal success of cattle ranching in the semiarid Panhandle. Investors, including many from the British Isles, flocked to participate in the burgeoning cattle business. By the mid-1800s, three small frontier towns were bustling–Mobeetie, Tascosa, and Clarendon. Then two events changed history. The first event involved changing the use of land in the Texas Panhandle. Severe winters in 1885 and 1886 brought about “The Big Die-Up” of cattle, when herds froze to death against barbed wire fences. The ensuing “Cattle Bust” during a world-wide depression necessitated the breakup of large holdings into smaller ranches and farms, thus increasing the regional population dramatically. Stock farmers found the fertile High Plains soil suitable for many crops, including kaffir corn, milo maize, sorghum and wheat. The second history-changing event was the coming of railroads to the Panhandle. In 1887 and 1888 two lines, the Fort Worth & Denver City and the Santa Fe, built toward what is now Amarillo. No longer would pioneer settlers be dependent for transportation upon horses or horse-drawn vehicles. Trains brought the world to the Panhandle and took its citizens out into the world. This area was no longer the frontier. In 1887 Amarillo began as “Ragtown,” a tent camp of about 500 workers on the right-of-way for construction of the FW&DC line. The nearby settlement initiated by J.I. Berry, an experienced townsite developer from Abilene, sprang to life on the south bank of a playa lake. The lake was a well-known landmark to Indians, Comancheros, early explorers and trailblazers, and it had become a favorite watering place for cattle since the coming of Anglo ranchers. Berry’s chosen site was contended by four others, but it won designation as Potter County seat after some political, maneuvering with the help of cowboys on the LX Ranch,, That election on August 30,1887, assured Berry such anchors as a courthouse and a depot for his town. Many early residents had to cook with cowchip fuel and haul water from Amarillo Creek. Women did their washing in the adjacent playa, Amarillo Lake (later called Wild Horse Lake). 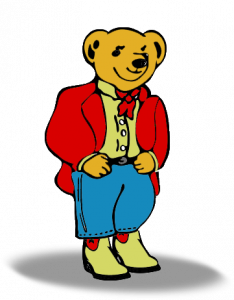 Berry first named his town Oneida, but it soon changed to Amarillo. The name of the town was chosen, it is thought, because Amarillo (Spanish for yellow) was the longtime predominant name for geological features in the area, such as the yellowish soil on the banks of the nearby Amarillo Creek. At any rate, in deference to the new name, most early houses in the settlement were painted yellow. The Spanish pronunciation, Ah-mah-ree-yoh, was used at that time, as it had been long before the first settler the original Amarillo practically deserted. Sanborn came to the Panhandle Plains–back when, Spanish explorers and itinerant Mexican sheepherders named landmarks. Editor C.F. Rudolph of the Tascosa Pioneer newspaper blamed the conductors of FW&DC passenger trains for “corrupting” the beautiful Spanish word as they “displayed their ignorance” by passing through the cars calling out “Am-ah-rillow.” Within a year everyone was using the new pronunciation. Rudolph wrote wistfully, “Never again will it be Ah-mah-ree-yo.” And it never has been. 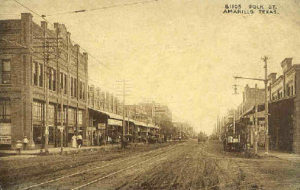 Three months after its founding, Amarillo had a post office and the businessmen who had come from Colorado City to help Berry establish the town had opened a few stores, the focal point of the business district being present-day Third and Parker Streets. The founding fathers erected a 25-room frame hotel, The Champion. The town was platted, lots were sold, and a temporary frame courthouse served Potter County until a more substantial one was built of bricks from Amarillo creek clay. As soon as railroad freight service became available in October 1887, cattle shipping began to focus on Amarillo. Soon 100,000 or more head were being shipped each year, continuing for a decade. In the years 1892-1897, Amarillo was the largest rural shipping point for cattle in the nation. But in the spring of 1889, after heavy rains at times almost inundated the first site of Amarillo, residents of “Old Town,” as it came to be known, succumbed to the wooing of H.B. Sanborn to move a mile east to his Polk Street vicinity, where his contending site for the town was on higher ground. purchased Old Town’s frame hotel and moved it up to become an annex behind his $40,000 showplace Amarillo Hotel on the southwest corner of Third and Polk. All streets were unpaved for more than a decade. To persuade the newspaper editor, H.H. Brookes, to move his publication, The Amarillo Champion, to the new town, the promoter gave him a block of land adjoining the business district, a block bounded by Polk, Tyler, 7th and 8th Streets (later the most valuable block in Amarillo). Sanborn, who became known as the founder of Amarillo, also donated half a block for Amarillo’s first church building, 701 Jackson St., to serve all denominations. Amarillo was beginning to blossom. At last the town began to think seriously about a public school for its children, some of whom had received lessons for several months in two small classes in private homes. It is interesting to view the progress of education in Amarillo, and particularly in Amarillo High School, in the light of the city’s humble beginnings and historically recent emergence as a community on the High Plains of Texas.